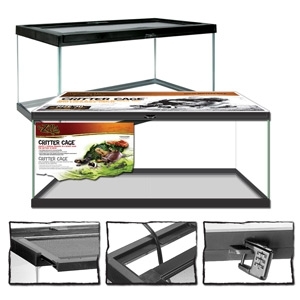 More reptile and small animal fanciers choose Critter Cage™, thanks to bonus features in the top frame that add strength, ease access and improve safety. The top is escape-resistant mesh, framed in a strong self-aligning frame that opens and closes with a smooth slide every time. A safety catch closes with a positive snap. Extra security is added through the built-in lockable latch. Pet comfort and health is assured by a recessed hanging space for water bottles, plus wiring ports to neatly channel heater cords.